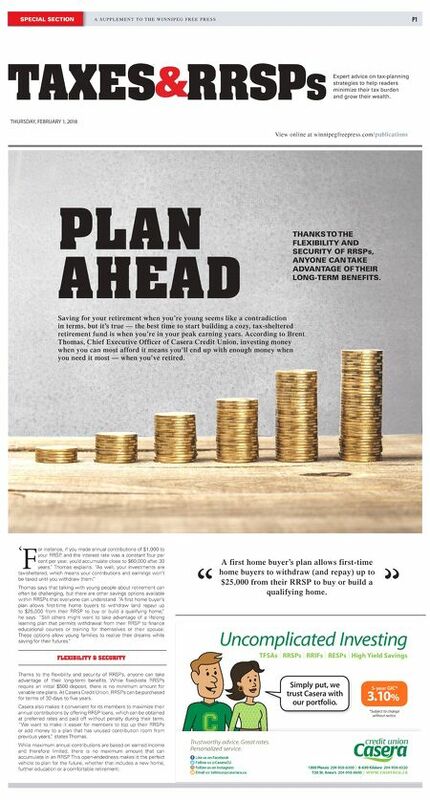 THURSDAY, FEBRUARY 1, 2018 SPECIAL SECTION A S U P P L E M E N T T O T H E W I N N I P E G F R E E P R E S S View online at winnipegfreepress.com/publications Expert advice on tax-planning strategies to help readers minimize their tax burden and grow their wealth. Trustworthy advice. Great rates. Personalized service. Simply put, we trust Casera with our portfolio. Uncomplicated Investing TFSAs | RRSPs | RRIFs | RESPs | High Yield Savings 1300 Plessis 204-958-6300 | 8-630 Kildare 204-958-6320 720 St. Anne's 204-958-6600 | www.caseracu.ca Follow us @CaseraCU Follow us on Instagram Email us: talktous@caseracu.ca Like us on Facebook *Subject to change without notice. 5-year GIC* 3.10% P1 & TAXES RRSPS ' F or instance, if you made annual contributions of $1,000 to your RRSP, and the interest rate was a constant four per cent per year, you'd accumulate close to $60,000 after 30 years," Thomas explains. "As well, your investments are tax-sheltered, which means your contributions and earnings won't be taxed until you withdraw them." Thomas says that talking with young people about retirement can often be challenging, but there are other savings options available within RRSPs that everyone can understand. "A first home buyer's plan allows first-time home buyers to withdraw (and repay) up to $25,000 from their RRSP to buy or build a qualifying home," he says. "Still others might want to take advantage of a lifelong learning plan that permits withdrawal from their RRSP to finance educational courses or training for themselves or their spouse. These options allow young families to realize their dreams while saving for their futures." FLEXIBILITY & SECURITY Thanks to the flexibility and security of RRSPs, anyone can take advantage of their long-term benefits. While fixed-rate RRSPs require an initial $500 deposit, there is no minimum amount for variable rate plans. At Casera Credit Union, RRSPs can be purchased for terms of 30 days to five years. Casera also makes it convenient for its members to maximize their annual contributions by offering RRSP loans, which can be obtained at preferred rates and paid off without penalty during their term. "We want to make it easier for members to top up their RRSPs or add money to a plan that has unused contribution room from previous years," states Thomas. While maximum annual contributions are based on earned income and therefore limited, there is no maximum amount that can accumulate in an RRSP. This open-endedness makes it the perfect vehicle to plan for the future, whether that includes a new home, further education or a comfortable retirement. Saving for your retirement when you're young seems like a contradiction in terms, but it's true — the best time to start building a cozy, tax-sheltered retirement fund is when you're in your peak earning years. According to Brent Thomas, Chief Executive Officer of Casera Credit Union, investing money when you can most afford it means you'll end up with enough money when you need it most — when you've retired. PLAN AHEAD A first home buyer's plan allows first-time home buyers to withdraw (and repay) up to $25,000 from their RRSP to buy or build a qualifying home. " " THANKS TO THE FLEXIBILITY AND SECURITY OF RRSPs, ANYONE CAN TAKE ADVANTAGE OF THEIR LONG-TERM BENEFITS.